This Magnetic Wireless Charger Kit is designed for iPhone series. This Magnetic Wireless Charger Kit is designed for iPhone series. The 4.7-inch is for iPhone 6/6s/7, while the 5.5-inch is for iPhone 6 plus/6s plus/7 plus. It comes with built-in 2500mAh battery. Get it as a spare part. • The Charger Case is very thin which is very like a phone case and will charge and protect your phone at the same time. • 2500mAh super power and will always keep your phone full of energy! 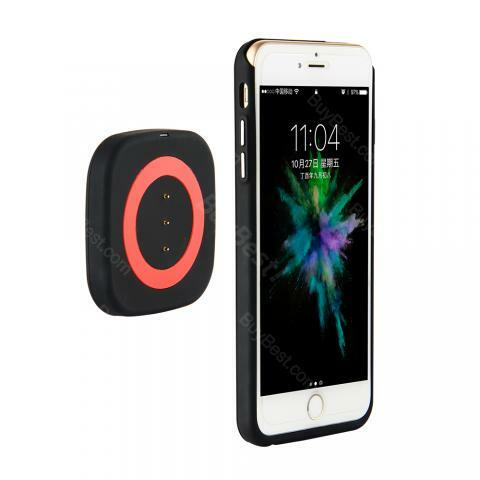 • The wireless charger and magnetic emitter matches each other perfectly and very easy and carry and use. It is also confortable to hold on. • Wide Compatibility: 4.7-inch Charger Case is for iPhone 6/6s/7/8 iPhone 6/6s/7/8. 5.5-inch Charger Case is for iPhone 6 plus/6s plus/7 plus/8 plus. • The type 5.5-inch is for iPhone 6 plus/6s plus/7 plus/8 plus. Yet another wonderful product from Jackery - a name I trust for my mobile charging needs. Pro’s - QI wireless charging compliant, sleek and professional grade appearance with high gloss finish. USB-C input quick charging of the battery. LED’s lights do you always know the status of the battery with a press of a button. Love it back up Battery lasts a long time . Love fact no wires needed . I was really surprised when my fuel ion base actually held it and charged it. Great unit. Works perfect. Holds phone without any issues and charges perfect. Love it! This charger provided a quick cord free charge which is exactly what I was looking for. No more broken charging cords here! Love that it can charge 2 phones at once too. Def recommend!